Implant Dentistry has changed the game when it comes to cosmetic and restorative dentistry. Put simply, dental implants are artificial teeth roots. At first, that might not sound very impressive, but implant dentistry at our Boise office solves the complaints and issues associated with traditional restorations like dental bridges and dentures. When choosing a tooth implant dentist, remember that not every implant dentistry practice in the Eagle or Meridian ID area offers the same quality of work and options. We offer the highest quality implant dentistry procedures and technology available. We both place AND restore dental implants in our Boise office near Eagle ID. Depending on your situation, you may need regular dental implants, a mini tooth implant or a combination of both. 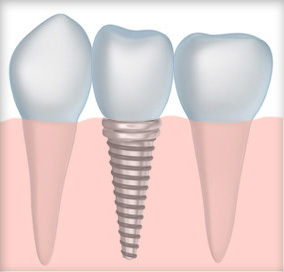 We offer and place both types of dental implants. We offer individual implant and crown restorations. We also offer implant supported dentures, including the remarkable Same Day Dentures treatment (A.K.A. – teeth in a day). We utilize a special Cone Beam 3-D scanner which enables us to place a tooth implant with astounding precision. Dr. Blaisdell invests the time and resources needed to stay at the forefront of implant dentistry and offer the tremendous benefits of a tooth implant to his Boise, Eagle and Meridian ID area patients. FUNCTION | A tooth implant functions just like your natural tooth root. When your tooth implant is restored with a high quality crown, you may forget it’s not your natural tooth from time to time. DURABLE | Dental implants are amazingly durable. You don’t have to worry about chipping or cracking the tooth implant. Dental implants can take the abuse. APPEARANCE | Dr. Blaisdell offers some of the finest quality tooth implant restorations available. They look incredibly natural and most may never even suspect they are not your real teeth. PERMANENT | Dental implants can be permanent and last just as long as you. 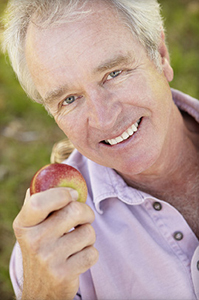 Schedule a Tooth Implant Consultation in Boise! Whether you have questions about tooth implants or you’d like to schedule a consultation with Dr. Blaisdell, feel free to call, text, or contact our Boise dentist office using the form on this page. We have helped hundreds of advise patients around the Eagle and Meridian, ID on whether implant dentistry is right for them and we look forward to helping you. For more in-depth information about our dental implant services, please check our implant site at http://www.dentalimplantsinboise.com/.